An American businessman, author, politician, and philanthropist. His net worth is estimated at US$ 53.4 billion, as of July 2017, ranking him as the 6th richest person in the United States and the 10th richest person in the world. He has joined The Giving Pledge, whereby billionaires pledge to give away at least half of their wealth. 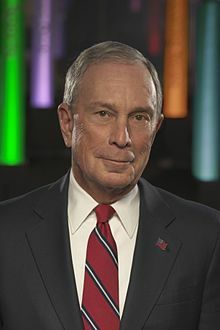 Bloomberg is the founder, CEO, and owner of Bloomberg L.P., a global financial services, mass media, and software company that bears his name, and is notable for its Bloomberg Terminal, a computer software system providing financial data widely used in the global financial services industry. He began his career at the securities brokerage Salomon Brothers, before forming his own company in 1981 and spending the next twenty years as its chairman and CEO. Michael Bloomberg also served as chairman of the board of trustees at his alma mater, Johns Hopkins University, from 1996 to 2002.